Tells the story of Jesus' birth in Bethlehem to explain why we give presents at Christmas. - Publisher Here is the story of the birth of Jesus and the original reason behind Christmas told in a simple manner that toddlers will understand, in a compact board book version. - Publisher Ages toddler and upwards. The simple words and illustrations, and durable heavy pages will ensure many hours of joyful reading the festive season. 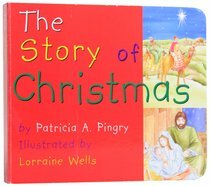 Here is the story of the birth of Jesus and the original reason behind Christmas told in a simple manner that toddlers will understand, in a compact board book version. Ages toddler and upwards. The simple words and illustrations, and durable heavy pages will ensure many hours of joyful reading the festive season.